I feel the same about Clarins lol. I hardly ever stop to swatch there because of the lure of more 'exciting' brands. 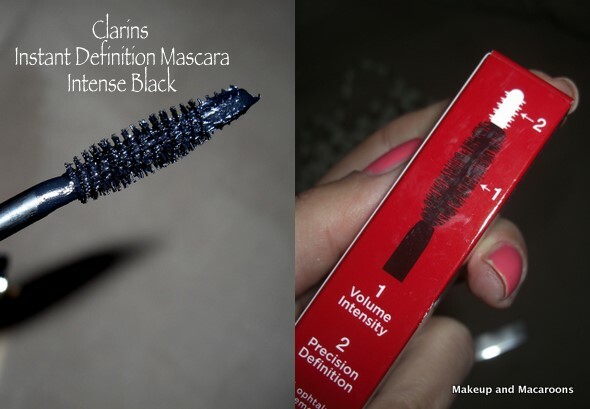 The mascara makes your lashes look like falsies! Love it. Might pick up a tube next time I'm doing a US buy. Jen - we have beauty ADD, as soon as a newer, shinier brand is out there we forget about everything else! Sahar - I know, I mainly buy drugstore mascaras so this is def more than I usually spend, but it is a good one. the wand's tip for corner lashes is such a great idea. the quality of the product looks great in your photos. i really love your blog! I feel like Clarins is a really clean and clinical brand - kind of like Clinique. I've read really great reviews about their primer (it comes in a pot) and when I swatched it at the counter if felt very nice and smooth on the skin. I've been thinking about picking that up for a while, so you've inspired me to stop by Clarins and have a play! I've never purchased from Clarins - but yes, I do tend to ignore the classics for the funkier more youthful brands. Your lashes look amazing with this on. Power to the drag queen lashes! Off topic...PLEASE tell me what you're wearing on that gorgeous face and lips of yours! You look BEAUTIFUL! Thanks for the review Hun and btw you look stunning in the picture,your make up skills are amazing!! Thanks for your comments everyone. Next time you're at clarins give their products a swatch, I know I will! Eden - I still have more photos with this look, so I will do a FOTD breakdown sometime next week. That lipstick is Barry M 147 btw. Wow, it looks amazing on you! But your already have long lashes to start with, I'm jealous! PopBlush - thanks hun, and the lippie is a cheapie Barry M 147, pretty good actually. Gaby - thanks hun, but the mascara def helps to define it tough. ooo pretty lashes! They are so long ;) I have never tried anything from Clarins before, but now you have made me curious about exploring the brand, lol! Anyway I also like drag queen mega lashes, so I think this looks amazing on you!